I played a lot of baseball growing up. My best season in high school I had a batting average of .427 for the year. If you know anything about baseball - that's a pretty darn good batting average. Any coach would take a player batting .427 to be on his team. I'm not bragging though...because when it comes to running my average is probably about the same as my high school batting average. I feel like I only do 42.7% of the runs I set out to do. Even when training for my first half marathon I skipped tons of runs during the week. I always made sure to get in the long runs, but the runs that counted during the week that would build up my strength and conditioning...I skipped. I'm working so much that you need the rest. I'm working so much that I need to skip the run to spend time with my family. All excuses...and all not good enough. I've committed to becoming more consistent with not only running, but various areas of my life. I want to spend less time online. I want to spend less time watching pointless television. I want to spend more time reading my Bible. I want to spend more time helping others. I want to spend less time complaining. I want to spend more time thinking positive. I want to spend more time motivating others. I want to run 5 days a week...Monday-Friday...no excuses. I want to not look at my phone from 9PM-6AM except to set my alarm. I want to love my wife and daughter more than I did the day before. I want be more patient. I want to be more consistent with blogging. How about you? 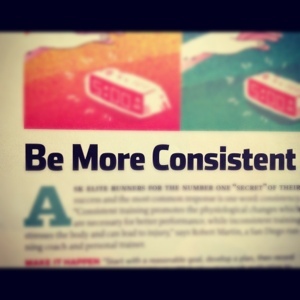 What areas of your life do you need to be more consistent in? I found this picture in an old edition of Runner's World....pretty fitting. This is a great post, and a great challenge to re-examine all areas of my life! I'm hoping to be more consistent with my running and making real, quality time for my husband.